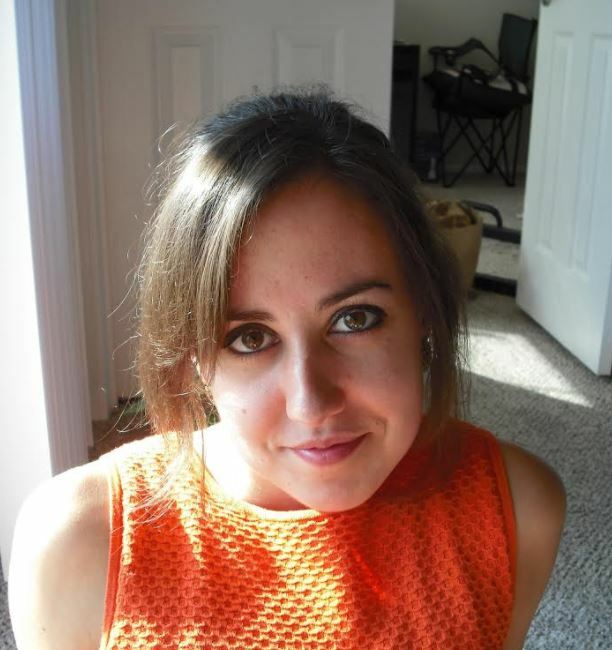 Rebecca Drummond, PhD, is a post-doctoral scientist working at the National Institutes of Health, USA. Dr Drummond’s research aims to understand why some people get fungal infections and others do not. To do this she must understand how the immune system prevents fungal infections and the risk factors that make an infection more likely. In this blog, Rebecca explains how mice can help us to understand how bacteria and fungi can affect the immune system and development of gut-related disorders, like irritable bowel disease (IBD). Our intestines are home to billions of microbes, which help digest food and maintain a healthy immune system. These microbes, known as the ‘microbiome’, are a mixture of bacteria, fungi and viruses, and individual species can have a huge impact on the health of our gut. The bacteria in our microbiome has been studied for decades, using samples from human volunteers and mice. While human research has allowed us to make connections between microbiome patterns and disease, it’s the work with mice that actually help us understand the fine details of how bacteria in our gut may cause or prevent disease. In contrast to research on gut bacteria, research into the fungal population (the ‘mycobiome’) within our intestines has lagged behind. This is because this branch of life is often underappreciated and misunderstood, but this is now beginning to change and recent studies indicate that the mycobiome can profoundly impact the health of our gut. Since fungi are common inhabitants of our intestines, one of the major interests in the field is how these intestinal fungi affect the health of our gut and what harm they might do if they ‘escape’. 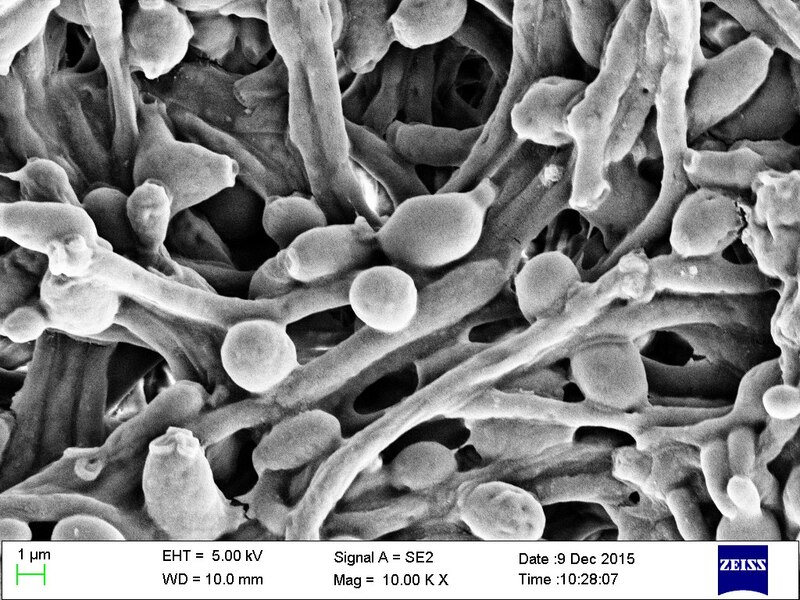 Fungal infections are one of the hardest to diagnose and treat, killing more than 2 million people every year and are also responsible for exacerbating other diseases like asthma and inflammatory bowel disease (IBD). Yet, fungi receive a surprisingly small amount of attention in the news and research community. Microscopy image of fungi in a mouse intestine. 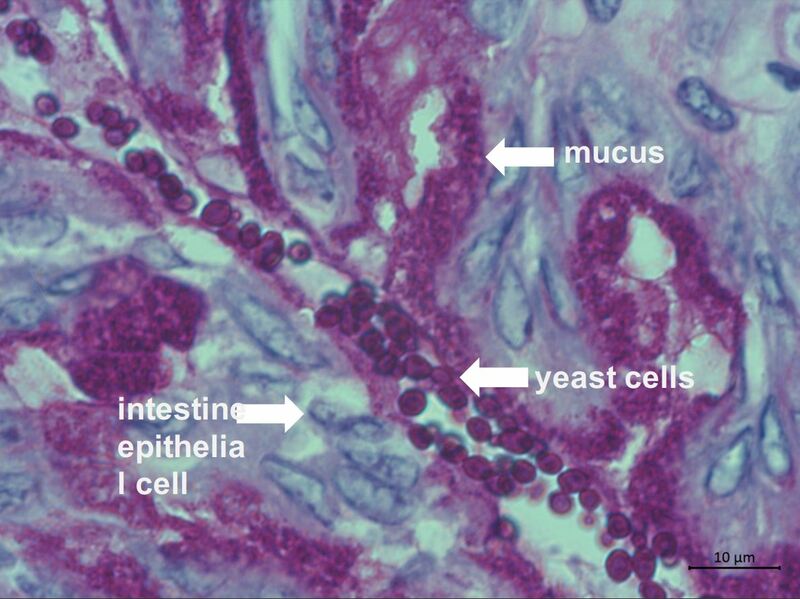 Yeast cells interact with the cells of the intestine (epithelium) and mucus. Image courtesy of Dr Simon Vautier, NIH. It’s therefore important to understand how our immune system handles fungi and prevents an infection. It’s well accepted that some species of bacteria in our gut can promote healthy intestines (probiotics or ‘good bacteria’ – you’ve probably seen these sold in yoghurt at the supermarket), while other bacteria can cause stomach ulcers. It’s therefore reasonable to assume that different fungal species might have similar benefits or health risks, and some recent research has shown that this is the case. For example, inflammatory bowel disease (IBD) is a condition where the immune system attacks the intestine for reasons that we don’t yet fully understand, and it’s long been known that proteins in our blood (antibodies) that stick to a fungus called Saccharomyces cerevisiae (anti-S. cerevisiae antibodies: ASCA) correlate with the incidence of IBD. So, if you have IBD, it’s likely that you have more ASCA in your blood. Moreover, mutations in genes that are needed to activate immune responses against fungi have been repeatedly linked to IBD and an overgrowth of fungi in the gut. Studies using samples from IBD patients have shown that a disturbance (‘dysbiosis’) of the mycobiome is a common occurrence in IBD; patients with IBD have increased amounts of a fungus called Candida albicans, and the ratio between different fungal species is not normal in IBD patients compared to people who have never experienced IBD. In human studies like this, we can only ever make assumptions from this type of data, but it is difficult, if not impossible, to determine causality. It’s not clear whether the mycobiome dysbiosis in IBD patients is a cause of the IBD, or a consequence. To help understand these sorts of correlations and make sense of them, we can use mice as a model system. Mice are commonly used for immunology research because the immune system is similar between different species of mammals; mice have the same types of immune cells that carry out similar functions as their human counterparts. We know this because mutations in genes that are important for preventing IBD or fungal disease cause similar diseases in mice as they do in humans. Mice also provide us with a way of obtaining samples of intestine tissue, since it would be difficult to find human volunteers for such research which would also suffer from the lack of laboratory controls. The complexity of the gut also means that we can’t use petri-dishes, because we simply can’t model the thousands of interactions happening in the gut in a petri-dish. We can also breed mice so that they have no bacteria or fungi in their intestines. These are known as ‘germ-free’ mice and are particularly useful for studies that want to analyze how an individual species of bacteria or fungi affects the intestinal immune system and our metabolism; something that isn’t possible to do in humans. To give an example, if you take germ-free mice and feed them the yeast S. cerevisiae (the one that ASCA binds to and indicates IBD), you can make the symptoms of IBD worse. Researchers showed that this was because S. cerevisiae caused a build-up of uric acid as it grew in the intestine. Uric acid activates our immune cells so they become over-excited and start to attack the intestine, basically causing symptoms of IBD. These types of experiments can help us understand the possible mechanisms resulting in IBD and the roles our microbiota might play in the development of this disease. Germ-Free Animal Facility. 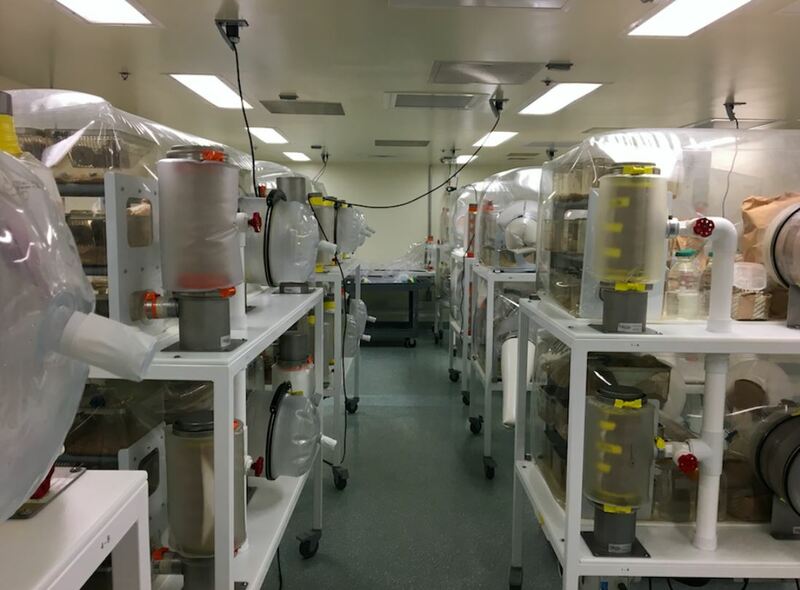 Animals are bred and kept within isolator units to keep them sterile from outside bacteria, fungi and other microbes found in the environment. Photograph courtesy of Yasmine Belkaid, NIAID, NIH. In addition to looking at individual species, we can also use mice to understand relationships between bacteria and fungi living together side-by-side in the gut. Changing the amount of fungi in the gut, by introducing a new species in the diet or depleting lots of fungi at once with antifungal drugs, subsequently changes the amounts of different bacteria in the gut. The same is true when you do the opposite experiment – antibiotic treatment (which kills off the bacteria, not the fungi) causes fungi in the intestine to grow like crazy, a phenomenon known as a fungal bloom. These blooms are thought to be one of the ways a patient could contract a dangerous blood-poisoning fungal infection called systemic candidiasis, which if treated, still only has a 50/50 chance for survival. So, if fungi can exacerbate IBD and be a potential source for blood-poisoning, should we be treating patients with antifungal drugs to prevent this? For IBD at least, mouse models suggest that this strategy won’t work. Mice treated with antifungal drugs weren’t helped at all – they actually developed worse IBD after treatment than mice that were left untreated. This was because the antifungal drug treatment doesn’t completely get rid of all the different species of fungi in the gut. Instead, you get rid of some species, and the remaining fungi (which are resistant to the drugs) start to grow and takeover. This is what we call a dysbiosis of the mycobiome, and we’ve seen it before – in patients with IBD. The number of papers discussing the mycobiome has seen a 10-fold increase since 2013, indicating that awareness of fungi and fungal infections is on the rise. More research is needed to understand our relationship with fungi and this critically depends on using animal models, without which we wouldn’t have learned how the fungi and bacteria in our guts exacerbate diseases like IBD. By better understanding this, we can begin to decide what to do about it and develop treatments for the future. Previous Previous post: Research Roundup: Mouse model of bipolar disorder shows promise, fighting cancer with Polio and more!